UK financial regulators and the Serious Fraud Office are to review if banks HSBC and Standard Chartered are linked to a South Africa corruption scandal. It comes after Lord Peter Hain said the banks may "inadvertently have been conduits" for laundered money. The Labour peer told the House of Lords that up to £400m of illicit funds may have been moved by the banks. 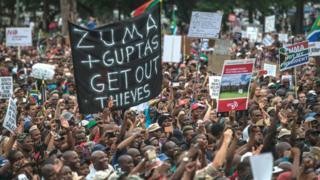 His concerns relate to links between South Africa's President Jacob Zuma and a wealthy business family, the Guptas. The peer has written to the Chancellor Philip Hammond, telling him a whistle-blower had indicated the banks "maybe inadvertently have been conduits for the corrupt proceeds of money". Lord Hain told the BBC he named 27 people in the letter, in addition to companies, adding that any person or firm linked to alleged corruption in South Africa is "going to be badly contaminated". The Treasury has referred Lord Hain's letter to regulators, including the Financial Conduct Authority, and the SFO. A Treasury spokesman said: "We take allegations of financial misconduct very seriously, and have passed Lord Hain's letter on to the Financial Conduct Authority and relevant UK law enforcement agencies, including the National Crime Agency and Serious Fraud Office, to agree the right action." The BBC's correspondent in Johannesburg, Andrew Harding, said Lord Hain's letter was "a new twist in a giant corruption scandal that is shaking the South Africa state, and damaging the reputations of a number of global companies". Mr Zuma and the Guptas strongly deny wrongdoing, and say they are victims of a "politically motivated witch-hunt". But leaked emails and official investigations have fuelled claims that the Guptas have bought influence in government in order to loot state enterprises. In South Africa, the scandal has already ruined British public relations company Bell Pottinger and damaged auditors KPMG, which removed its top executive team in the country. A spokeswoman for the FCA said it was already in contact with the banks named by Lord Hain and would "consider carefully further responses received". Standard Chartered said: "We are not able to comment on the details of client transactions, but can confirm that following an internal investigation accounts were closed by us in 2014." HSBC declined to comment. Lord Hain, a leading anti-apartheid campaigner who grew up in South Africa, urged UK authorities "to track that stolen money down and make sure that British financial institutions help return it to South African taxpayers". It is claimed that money was taken out of South Africa via Hong Kong and Dubai. Lord Hain, a former Northern Ireland secretary, alleged in his letter to the chancellor that the issue was "a result of the corruption and cronyism presided over by President Zuma and close allies the Guptas". During his Lords statement, the peer asked what steps the government was taking to prevent money laundering through UK banks. The minister, Lord Bates, said the UK is "committed" to fighting money laundering and is "concerned" at the allegations. He added that the high commission in South Africa is "monitoring the issue closely". Meanwhile, the Financial Times on Thursday reported that the FBI had opened an investigation into possible links between the Guptas and "individuals, bank accounts, and companies in the US". The Gupta brothers Ajay, Atul and Rajesh Gupta have interests in computer, mining, media, travel, energy and technology and employ about 10,000 people through their company Sahara Group.